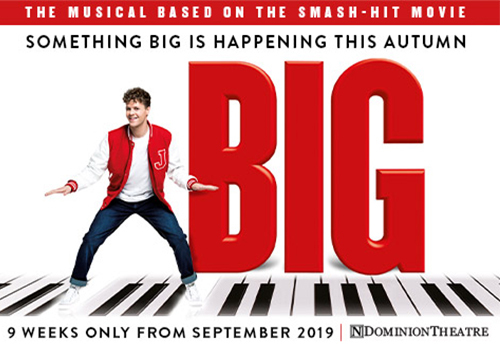 Smash-hit 80s film BIG gets a musical adaptation as it leaps into London’s Dominion Theatre in September for a limited 9-week run. The 1988 film, starring Tom Hanks, earned two Academy Award nominations, including Best Actor, and is highly regarded as one of the funniest films of all time. The musical premiered on Broadway in 1996 and earned five Tony Award nominations, including Best Score. The UK production visited Plymouth and Dublin back in 2016, starring The Wanted’s Jay McGuinness in the lead role of Josh. The musical will now have its West End premiere at the Dominion Theatre. Jay McGuiness reprises his role as Josh. The Wanted member won Strictly Come Dancing in 2015, and recently appeared in Rip It Up - The 60s alongside Aston Merrygold, Harry Judd, and Louis Smith. BIG’s music comes from David Shire and Richard Maltby, with a book by John Weidman (Assassins, Anything Goes). Direction and choreography comes from Morgan Young (White Christmas). Don’t miss out on the West End premiere of this heartwarming, big-hearted new musical. BIG runs at the Dominion Theatre, London, from September 6th – November 2nd 2019. BIG is suitable for families, and children over 8+.